The last in our mini-series of plus size costumes for men who aren’t ashamed of the fact that they don’t devote their entire lives to the gym and know it’s ok to have one (ok, many) Bud Lights now and again, this is part III! Halloween Adventures has compiled a list of the best plus size costumes out there for both men and women, and we’re sure it takes the cake to any other list out there. You see, our costumes aren’t different than those for skinny minnies. They’re just the same outfits made a little bit bigger. So shop away and feel good about doing it! We’ll start with the most powerful man in Egyptian history, the man who ordered the pyramids built from his cement throne. That’s right, it’s Pharaoh. Our Pharaoh Historical Egypt Costume in Plus Size is bound to impress. It includes a long white tunic with stripes at the bottom, gold collar with Egyptian print fabric accents, matching gold belt and a fabric headpiece with stripes and gold band. Badass, for sure. One of the great things about a pirate costume is that you really can’t go wrong. It’s the never fail option. It’s always bad, always just a little bit scary, and always impresses the ladies. 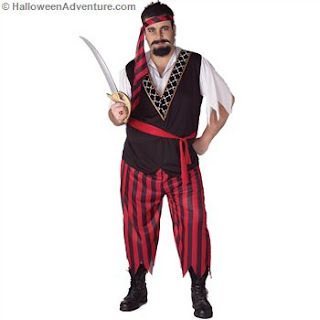 Our Pirate Halloween Costume in Plus Size Adult is an absolute winner. This costume is a classic and includes a red & black head sash, white shirt with attached skull trimmed black vest, belt and red & black striped pants. Looking to shake things up a bit? Try a classic police officer costume. Yes, we know it’s been done before, but it’s another no fail option, and to be honest, wearing one is quite the power trip. Our Police Officer Classic Costume in Plus Size includes shirt, pants, hat, belt, badge, handcuffs, and nightstick. It’s guaranteed to make you feel just a bit cooler as soon as you put it on. Speaking of cooler, if you’re looking for something cool and different, check out our Samurai Warrior Costume in Plus Size. The Samurai Warrior costume includes: hat with decorative ribbon, striped shirt, printed overtunic, black waist sash, and black pants. It makes you feel positively bad to the bone in a way that Americans just can’t seem to manage. Not to mention, it’s a great way to travel without actually leaving your town. If scary is what you’re craving, our Satan Adult Halloween Costume in Plus Size is the perfect match. 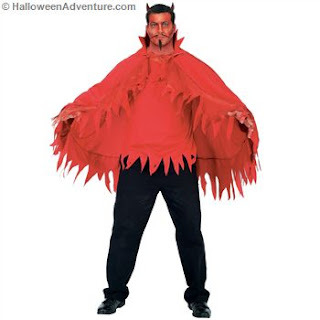 It includes a red shirt/cape and devil horns. We’d recommend you pair it with daring red face paint and a small black beard. Of course, a maniacal, evil laugh can’t hurt either. Sadly, this concludes our plus size series. Remember, there are always more options on our website at Halloween Adventures. We’ve got looks for all shapes and sizes, for every idea and every day of the year. Just because it’s not Halloween doesn’t mean there isn’t reason to celebrate, so log on and look around.